Maple and fruit syrups or honey are a treat whether you use them in tea or pour them over pancakes or use them in preparing your favorite recipe. Most syrup stains are fairly simple to remove unless artificial color has been added. Learn how to savor the sweetness and remove any stains that may drip down onto your shirt. Syrups are made from the sugars of plants and are tannin stains-a plant component that often shows in varying intensity of color in the final product. Fresh tannin stains can usually be removed by washing the garment or table linens with laundry detergent in the hottest water temperature recommended for the fabric on the care label. When a drip of syrup or honey lands on fabric, use a dull knife or edge of a credit card to lift as much of the solids away from the surface of the fabric as possible. Do not rub because that only forces the stain deeper into the fabric fibers. Dip a clean white cloth or paper towel in plain water and blot the stained area until you can fully wash the garment. Natural soaps like Fels Naptha are great for removing oily stains but never use natural soap in a bar or soap flakes to treat syrup stains because soap can make tannin stains more difficult to remove. 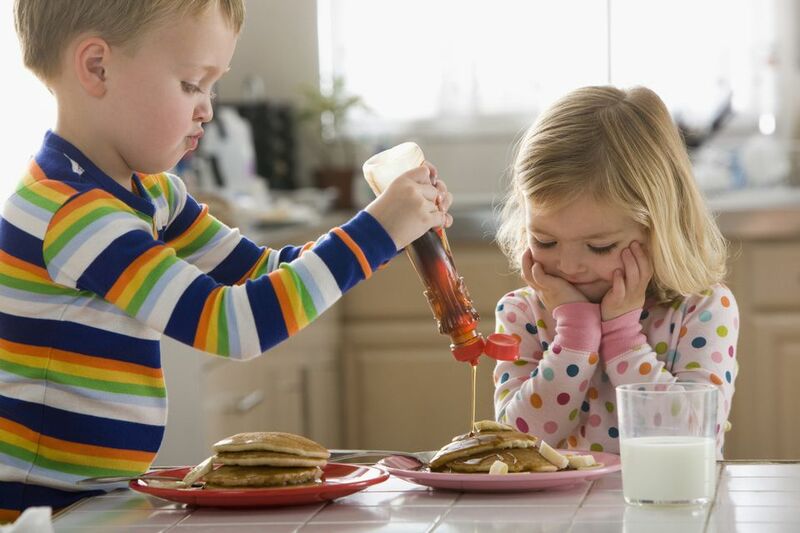 If the syrup stain is older and has set or if artificial color has been added to the product, additional treatment may be needed beyond washing. Chlorine bleach can be used to remove stains on white cotton garments and linens. For synthetic fabrics and colored or printed clothes, mix a solution of oxygen-based bleach (brand names are: OxiClean, Nellie's All Natural Oxygen Brightener, or OXO Brite) and lukewarm water following package directions. Mix enough to completely submerge the stained garment. Allow the stained item to soak at least four hours or overnight and then launder as usual. When that drip lands on a fabric that is labeled dry clean only, lift away as much of the drip as possible with a dull knife, edge of a spoon, or even a credit card edge. Blot the area with a cloth dipped in plain water to remove stickiness and then blot away any moisture with a dry paper towel. As soon as possible, head to the dry cleaner. Point out and identify the stain to your professional cleaner. If you choose to use a home dry cleaning kit, be sure to treat the stain with the provided stain remover before putting the garment in the dryer bag. When that puddle of syrup or honey lands on the carpet, use a spoon or dull knife to remove as much of the drip as possible. Again, don't wipe because you'll only be pushing the stain deeper into the fibers. Mix a solution of one teaspoon hand dishwashing detergent liquid with two cups warm water. Dip a clean white cloth or paper towel in the solution. Blot the syrup stain and keep moving to a clean area of the cloth until no more stain is transferred. Dip a cloth in plain cool water to "rinse" the cleaned area. It is important to remove all the soapy solution because it can actually attract soil. If there has been artificial dye added to the syrup and the stain remains, treat the stain with a clean cloth dipped in rubbing alcohol or hydrogen peroxide. This treatment should only be used on white or very light carpet because bleaching can occur. For discoloration on other colors of carpet, mix a solution of oxygen-based bleach in cool water following package directions. Dip a clean sponge into the solution or use an eye dropper to apply to the spot. Working from the outside edge of the stain toward the center, work the solution into the carpet. Do not over wet. Allow the solution to remain on the stain for at least 30 minutes before blotting away. Allow the cleaned area to air dry away from direct heat. Vacuum to lift carpet fibers. To remove a syrup drip from upholstery, you can use the same cleaning solutions and techniques recommended for carpet. Take extra care not to overwet the fabric because excess moisture in the furniture cushions can cause problems with mold and mildew. If the upholstery is vintage or silk, remove the solids and consult a furniture cleaning professional or if you need more stain removal tips.